For snacks we tried the nachos ($5) which came with plantain and tortilla chips, cheese, black beans, sour cream, salsa, guac and shredded beef! I was expecting to get a measly happy hour portion, but this was huge! I happily shared with four people! I loved the shredded beef in place of ground beef or chicken- but I suppose that’s the Cuban influence of the restaurant coming out. Reaaaaaaaally tasty snack. I also tried the chicken quesadilla ($6) which was a good enough portion for a nice meal. This wasn’t your typical quesadilla, for some reason it tasted heartier and well made, not like something you could get at a Friendly’s. We also ordered the chips and salsa ($3) and chose the plantain chips and mango salsa- you can get the traditional kind for the same amount. I am SO glad we tried this, what a nice change. The mango salsa was not overly sweet, especially because it had the right amount of kick to it. I love plantain chips, so I was bound to be happy with these. Our friends tried their ceviche ($5) and although they enjoyed it a lot, their portion size left something to be desired. However, we can let this slide since we are talking about freaking ceviche here, and usually that stuff can cost you a lot more anywhere else. Overall I was really happy we happened to check out this place before the show. We happened to peruse the regular menu, and all the items looked fabulous- although I’m not sure anything can compare to the happy hour- what a deal! We all collectively agreed that we would love to come again. I really urge you to visit this place, let me know what you think if you do! 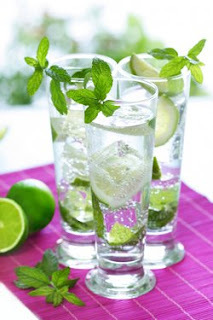 If you want a reason to visit, how about a free mojito? They are offering a free mojito with a purchase of $7 or more if you fill out this form on their website. Dan and I wanted to celebrate our first wedding anniversary in style- so we chose the ever elegant Petit Louis Bistro, a place that I have wanted to go here for a very long time. Before we went, I researched as much as I could and found that people seemed to really love the food but thought it was an incredibly noisy place. That concerned me because I wanted this to be a romantic dinner, but I decided to press on. In actuality, the noise didn’t bother me at all- it was a normal, bustling restaurant. Perhaps the tables were a bit too close, but that reminds me of any European restaurant- so maybe it was trying to give an authentic French flair? Besides, many popular restaurants have tables that are too close to one another—Woodberry Kitchen being one of them. Anyway, onto to the meal. Have I ever told you how much I love asparagus? Well, I do. So imagine my happiness when I saw that Petit Louis Bistro was offering an “Asparagus Menu ($30)” since they have local asparagus! I ordered it immediately, along with their suggested wine pairing ($16). The menu started off with Asparagus soup which was INCREDIBLE. It was wonderfully creamy and rich, and the flavor was just perfect. I never thought soup could make me so happy! I was literally cleaning my bowl with my spoon. The next item, the main course, was grilled salmon with asparagus (of course) and served with a tarragon, shallot butter sauce. This was just heavenly. The salmon was crispy on the outside, exactly how I like it- and then the inside was tender and fell away easily with the brush of a fork. 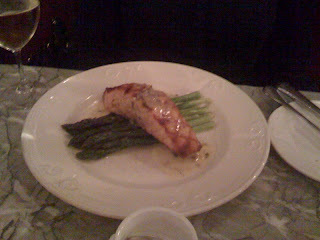 The asparagus and the sauce paired perfectly with the salmon- and I love to make sure I had all three on my fork. Loved it! I also liked that it was a generous portion for part of a fixed price menu- that can make me weary. Dan ordered the House Salad ($8) for starters, which was pretty steep for a house salad- especially because he assumed it was part of the meal! Luckily it was a good salad, and the house vinaigrette had the perfect amount of cheese! His entrée was the Rainbow Trout with almond butter and brown rice ($18). Dan LOVED this- even more than my salmon, and he’s usually a sucker for salmon. I thought it tasted like buttery popcorn, and he agreed- but in a really pleasant well. The rainbow trout is a perfect fish for those who don’t usually like fish- it’s a thicker consistency and not as fish-like! The sauce was really special, especially when mixed with the brown wild rice. For my menu’s dessert, there was nothing asparagus related- but that was ok! They served Beignets (pretty much like the French version of donuts) with ice cream and a thick chocolate sauce. I loved the chocolate sauce. YUM YUM YUM. I wanted to just eat up the chocolate sauce with a spoon. The beignets themselves were good- but they tasted like donuts, and I’m pretty sure I had a donut that morning so it wasn’t anything special hahahaha. It was actually a lot less sugary than a DD donut, which made the combination of the chocolate sauce and ice cream go really well. Incidentally- I really enjoyed having the wine pairings with each course. My absolute favorite was the sparkling wine served with the beignets (Clairette de Die, Jaillance NV). In fact, I want to go to my local wine shop, Swirl Wine, to try and find this particular wine. Oh yes- and our waiter, Marco G., was simply lovely! Overall, this was such a deserving place of a special occasion- but I hope that we go back for other times too, the food is just THAT good if you’re willing to spend a little more money. It’s the 70th birthday of the Old Bay Seasoning! If you’ve ever lived in Baltimore, or hell, even visited for a day- you have probably tried Old Bay. This seasoning is actually turning 70 this year, and so they are throwing an Old Bay themed celebration at Camden Yards during the Orioles vs. Braves game this Saturday. For all the foodies out there, Duff Goldman of Charm City Cakes and the Food Network Show, Ace of Cakes, will be there to unveil an Old Bay themed crazy cake creation! Not only that, he’ll be throwing the first pitch of the game! 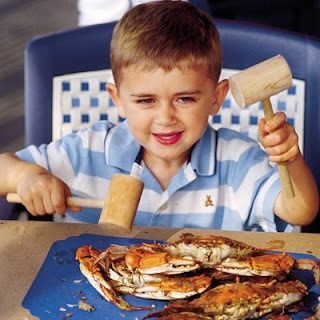 Also, Just in case you need another reason to go, the first 10,000 attendees, 15 and over, will receive an Old Bay mallet! So once you’ve finished soaking up some sun and Maryland wine at Great Grapes- head on over to Camden Yards for the Old Bay celebration. Talk about a Maryland-filled Saturday! This weekend, come to the scenic Oregon Ridge Park to sample over 200 wines from 20 Maryland wineries! I’ve gone to a couple of Great Grapes, and I’ve always had the best time. I’ve also always gone as a volunteer which is Great because I get to pour for a winery AND get into the Festival for free! I’ll be there this year, but I won’t tell you when and where so that my stalkers don’t find me (ahahahaha). As well as our amazing Maryland wineries, there are always a number of vendors that will be there, including some very own Baltimore crafters, as mentioned in the Baltimore Etsy Team blog. $18 advance online or $22 on-site includes a souvenir wine glass, unlimited samples, all performances and cooking demonstrations. $15 advance online or onsite and includes admission into the event ONLY. $16 (per ticket) for groups of 20 or more and must order by phone 800-830-3976.
p.s. If you are ever interested in volunteering at wine festivals in Maryland, go to the Maryland Wine Association website and sign up. At all California Tortilla's tomorrow, Wednesday June 10, buy an adult entrée and a child 10 or younger gets a FREE Kid's Meal. Plus if you make a donation to The Make a Wish Foundation of the Mid Atlantic you'll get a coupon for $1 off a later visit. Personally, I've had their taco salad and I've really enjoyed it! I’ve been excited to go to Abbey Burger for MONTHS. I’ve heard a lot of talk about the peanut butter burger, and I wanted to know what it was all about. Actually, that’s a lie—I wanted someone else want to know what it was all about- and then I would steal a bite. So we headed down to Federal Hill to find out what this burger place had to offer. I LOVE burgers, I love them a LOT and it’s always exciting to hear about burger places that decide to push the envelope a little. Don’t get me wrong, I also like the standard place that just does what it’s good at and is happy with that- but I like burger creativity once in a while. Also, I have to mention that all of their meats and cheeses (and maybe other ingredients) come from local farms. This was something I had NO idea about and so was really quite pleasantly surprised. So, luckily the PB burger ($9) called to Dan. It traditionally comes with Roseda beef, smoked bacon, and creamy peanut butter. Dan asked for it without the bacon and unfortunately he was NOT a fan of this burger AT ALL. I wonder if the bacon really makes a difference here, but I found that the flavors didn’t meld together and he thought the same. I tried the Harry’s Bistro Burger ($9) without the bacon as well. It came with roseda beef, sunny side egg (aka runny! ), and cheddar on an English muffin (which are actually called Crumpets in England). This was pretty delicious actually. I wished for some more cheddar, though because it was so good. Overall I really liked it, but I probably wouldn’t get it again because I really felt like it took ten years off my life. Dan would order this burger next time. My dad’s burger, the Gunpowder Bison Burger ($9) looked and tasted AMAZING. It came with onion rings, blue cheese, lettuce, tomato and mayo. I am usually not into blue cheese at all, but the combination of the moist bison burger (ask for it to be cooked MEDIUM) with the onion rings and blue cheese was just perfection. I would DEFINITELY get this next time, without fail. My mum tried the Chicken Burger ($9) which came with avocado, sprouts, lettuce, and chili mayo. The burger itself was a bit dry, but the avocado and mayo helped that along. There was definitely a kick from the mayo, and the avocado was a good sized chunk. This is a great option if you wanted something a bit healthy! Also, the sweet potato fries and regular fries were GREAT- perfectly salted. I preferred the sweet potato fries, and actually thought they rivaled Miss Shirley’s! Dan preferred the regular fries however, so either choice you win. So in the end, I was super happy with my meal at Abbey Burger. I will never get the PB burger, but I’m glad that I know it was gross so I can find more items on the menu I like. Oh! And one other thing to mention is that they also have a Build-Your-Own-Burger feature that I thought was a nice touch- perhaps I would even try that! My heart just skipped a few beats. 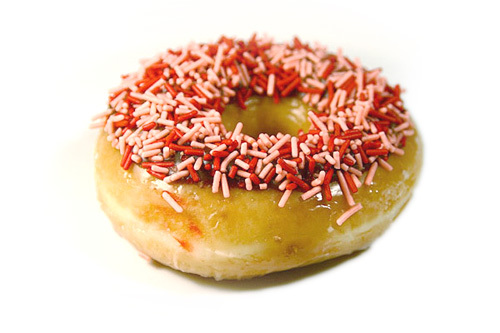 First of all, there's a National Donut Day? And then secondly, I can get a free donut on National Donut day? Free donuts for my tummy? Free sweet delicious amazing donuts? At Krispy Kreme, however, they're just going to give you a whole donut for free! Of course- this all depends on the store...but it's definitely worth it to find out!